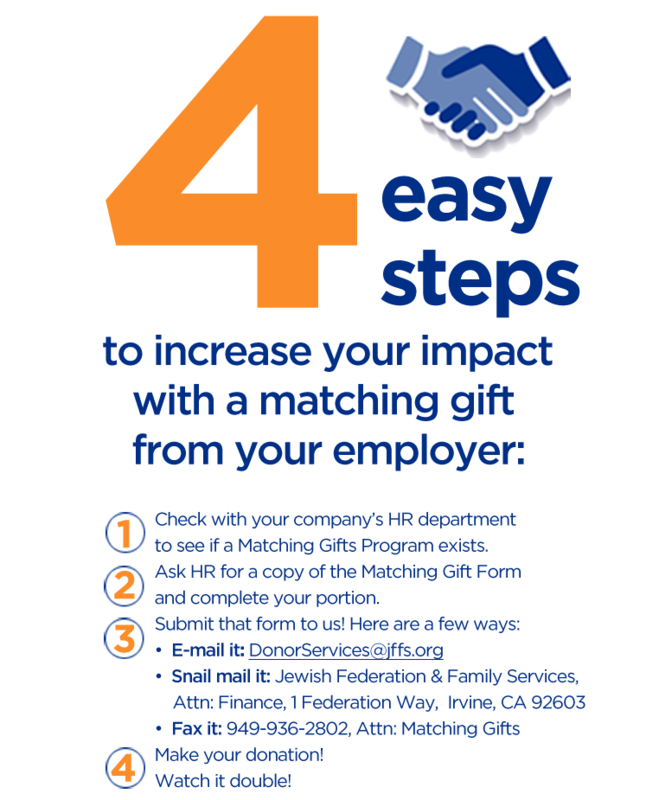 Did you know that many companies have gift-matching programs that will match your donation to Jewish Federation & Family Services (JFFS) dollar for dollar? Gifts may include monthly payroll deductions as well as annual gifts. Gift-matching programs are a great way to maximize your personal contribution to JFFS. Don't leave money on the table! Take advantage of your company's matching gift benefit to help increase YOUR impact for the community! For employees: You will be acknowledged at the recognition level that includes your employer’s match. For example, if you make a donation of $500 to JFFS and your employer’s matching gift brings the total contribution to $1,000, you will be recognized at the $1,000 level. This would give you eligibility to attend an event that requests a minimum suggested gift of $1,000. For employers: Donations received from employers through their matching-gift programs are fully tax-deductible. Is your company a Match-Maker? Click here for a peek at our list of companies who are Match-Makers and have historically offered employees a matching gift donation. Don't worry - if your company is not on this list, just check with your HR department. JFFS is a human/social service organization. The IRS does not consider JFFS to be a religious organization. As a 501(c)(3) corporation, we are required to file a 990 form, and we do so annually. A copy of our 990s can be found here. JFFS has maintained a perfect, 4-star Charity Navigator rating six years in a row. If your company requires an Employer Identification Number (EIN), please use 95-2407026. If your company offers a matching gift, JFFS will receive it only after you have made your pledge payment. What if my company prohibits matching gifts to religious organizations? I haven’t heard of such a program at my company. How do I find out? Email or call your organization's Human Resources (HR) Department or ask your supervisor. They will either provide you with the forms or steer you in the right direction. How will I know you received my company's matching gift? After you have made your payment to us, your company will follow suit. When we have received their payment, you will both receive an acknowledgement letter from us.